RT @WeAreTheDead: Sgt. Joseph Richard Wharrie (The Black Watch - Royal Highland Regiment of Canada). Feb. 28, 1945. 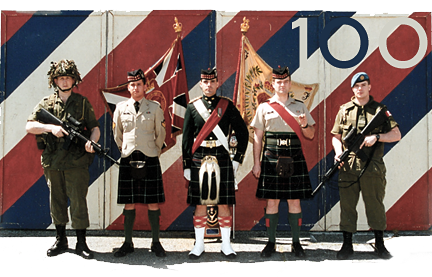 The Seaforth Highlanders of Canada Regimental Association was formed in 1917 primarily to promote and maintain the comradeship of the war time years. When the Regiment returned from active service it also took on the responsibility of providing assistance to members and their families who needed help in readjusting to civilian life. The organization’s role has remained more or less the same since that time although the nature of the support it provides to the regiment and its extended family has changed over the years the principal of “Once a Seaforth - always a Seaforth” remains. The Kit Shop offers a variety of high quality gifts, and apparel for the public and accessories for serving members. All proceeds help support The Seaforth Highlanders Regimental Family. Apply to become a member of the Regimental Association or Renew your Annual Membership. Options to renew online by credit card or print and pay with cash or cheque. The Official Newsletter of The Seaforth Highlanders of Canada Regimental Association. New editions several times a year. Every year the Regimental Association provides scholarships to deserving students. 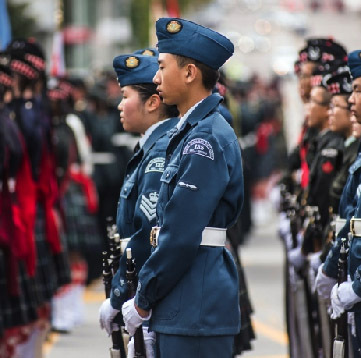 The Seaforth Highlanders of Canada are active in the Vancouver community with several parades and all-ages events open to the public at the Armoury every year. The cadets have expanded to six Corps throughout the Lower Mainland and on the Sunshine Coast. Today, over 300 young men and women are proud to call themselves Seaforth Cadets. 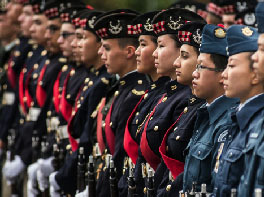 Cadets have become the biggest youth movement in Canada. Whether you are looking for part-time employment or just want to become involved in the Canadian Forces during your free time, you are encouraged to familiarize yourself with the information here and contact a recruiter if you meet the basic eligibility requirements. The Regiment is always in need of a helping hand at events and for development activities. Contact Rod Hoffmeister for more information about potential opportunities to contribute to the Regiment. The Foundation is the charitable arm of the Seaforth Highlanders of Canada Regiment. The goal is to raise funds to support the Regiment in areas not covered under the Department of National Defence budget. Income tax receipts are provided. The Seaforth Armoury is a Canadian Forces armory located at 1650 Burrard Street in Vancouver, British Columbia. The museum houses an extensive collection of Seaforth history and memorabilia and is worthwhile visiting for those who had family serve in the Regiment and those with an interest in the military history of Vancouver’s Infantry Regiment. On display are items from both world wars, Afghanistan and other operations between. The Seaforth Highlanders of Canada Museum is currently piloting their First World War Education Program. Aimed at students ages 14-18 (grades 9-12), this program includes a battlefield reconnaissance activity, artifact handling, and an examination of the cost of war. Students will learn about pre-war Vancouver, what it took to be a soldier during World War I, and conditions in the trenches of the First World War. The Seaforth Museum houses a unique and extensive collection of war memorabilia. Explore our digital records by category. The Seaforths played prominent roles in notable battles during World War I and World II. Learn about the most epic and memorable moments in Highlanders' history. A comprehensive collection of official war diaries from World War II. Top secret orders, intelligence summaries, field notes. Men of Valour. Brave boys. They fought for freedom. These are the stories of Canadians who chose to fight overseas against incredible odds. Explore our growing collection of firearms and weapons from the 1900's to present day. Uncovering the mysteries and romances amidst the heartache and violence, these stories show the human side of war. Hand and type written letters from soldiers in the field. Communications have changed much since the World Wars, but the patterns and passions of man never change. Check out the latest albums from The Seaforth Highlanders of Canada. The Seaforths are active in the community, taking part in events at the Armoury, local parades, training, research, and commemorative dinners, and traveling abroad for active duty, competitions, memorials, historical tours, and presentations. The growing collection of Seaforth Highlanders of Canada media from the museum archives, videos made by active members, alumni, and family members, and clips and films sourced from around the world and shared on the web. In 1931 a group of 16 prominent citizens and Seaforth officers formed the Vancouver Armoury Association, amongst them the future Lieutenant Governor of British Columbia, E.W. Hamber and former Vancouver Mayor, W.H. Malkin. If Ottawa wouldn’t build an armoury for the Seaforths, they would raise the money to do it themselves. They hired an architect, and began scouting for possible locations.